The was the first hike in the real winter. The high for the day was in the low 30's, and it was very windy. I needed my winter coat, hat, and gloves for this hike, as this was the first hike to break in the winter season. I had heard that the Appalachian Trail had been entirely re-routed with a brand new trail to the top, and I have been anxious for a while to try it. This was finally my oppurtunity. I parked near the Ice Skating Rink, and headed up towards to old Appalachian Route, and suprising it wasn't there. 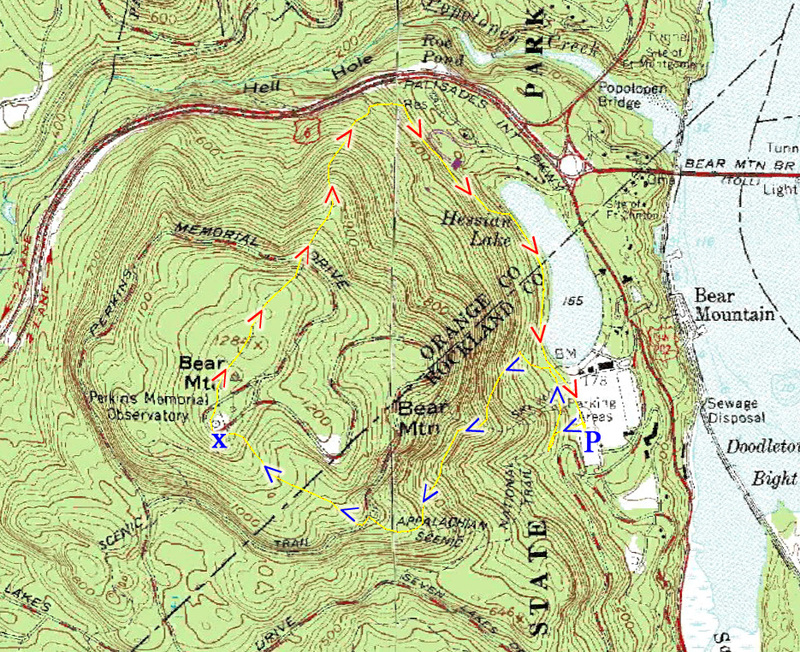 The S-BM Trail was instead extended all the way to the bottom of Bear Mountain, and the Appalachian Trail was pushed further north. It took a while for me to figure this out while I was heading the wrong way looking for the trail. I finally found the new trail, which starts right near the southern end of Hessian Lake. This new trail is impressive and quite an architectural feat, with the entire path being steps and gravel to the top (to prevent erosion). 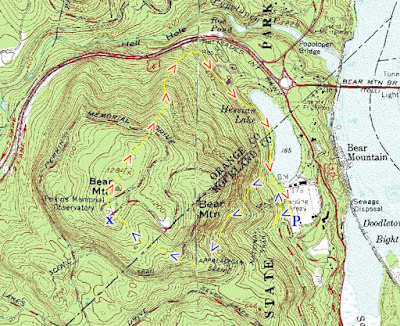 The Trail climbs a steep part of the mountain in meandering stairs, and then juts to the south while passing a nice seasonal waterfall, and eventally meets up with the original trail right near the end of dead-end circle at Perkins Drive. The trail officially continues along its original route up Perkins, but I saw they were rerouting it back to its original trail location. I decided to take this original and future portion of the trail to the top. The top was cold and very windy, and I had to quickly snap a few pictures before running back to the trail out of the exposure due to the fierce chilled winds. Headed down the mountain by way of the Major Welch Trail, and took this trail all the way back to my car. The ascent is all newly placed steps. The first view, less than halfway to the summit. Facing southeast towards Iona Island in the Hudson. The view at the summit. Facing southwest. Descending down the Major Welch Trail. Me at the Major Welch viewpoint.